Nuneaton and Bedworth is a local government district in northern Warwickshire consisting of the towns of Nuneaton and Bedworth, the village of Bulkington and the green belt land in between. It has a population of just over 120,000. 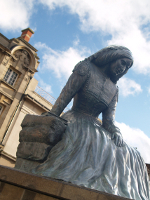 Nuneaton is the largest town in North Warwickshire and is famous for its associations with the 19th century author George Eliot (Mary Ann Evans). Nuneaton and Bedworth Borough Council is committed to meeting the eGovernment agenda. That is to develop eProcurement solutions which include, amongst others, electronic: sourcing, ordering, purchase cards, tendering, reverse auctions, marketplaces, catalogues and payment.